On August 14, 1964, the “Romashka” reactor-converter—the world's first setup with direct (thermoelectric) conversion of heat from235U fission into electricity—was started up at the I. V. Kurchatov Institute of Atomic Energy and service-life nuclear tests were begun. In 1999, 35 years have passed since the “Romashka” reactor-converter was first started up and trials began. “Romashka” successfully operated for about 15000 hours and generated ∼6100 kW·h of electricity. 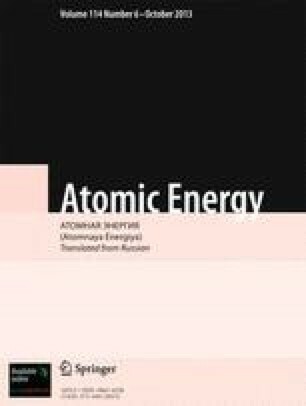 The startup and successful tests of the “Romashka” reactor-converter recieved in its time high marks from the world scientific community and they demonstrated that the world's first operating nuclear reactor-converter, capable of generating electricity without the participation of any moving working bodies or mechanisms, was developed in the short time of about 3 years in the Soviet Union, and it was shown experimentally that the system was capable of prolonged operation. The technology created in the process of developing the “Romashka” reactor-converter and, specifically, the thermoelectric silicon-germanium transducers have found application in operating space nuclear (reactor and isotopic) power systems. 3 figures. Russian Science Center “Kurchatov Institute”. Translated from Atomnaya Énergiya, Vol. 88, No. 3, pp. 176–183, March, 2000.